The design for the PenAgain was conceived in 1987 when the creator, Colin Roche was still a teenager in detention for being late one too many times. 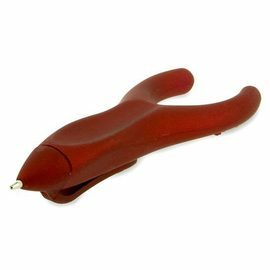 Earlier that day Colin had picked up a flexible toy pen from a local flea market, in the classroom he twisted the pen into a more confortable shape to write with. After making the first prototype the idea sat on the back-burner for more than ten years until a conversation with an old school friend spurred him on to make the idea into a marketable product. A few prototypes and years later the ergonomic PenAgain pens are now sold worldwide. Finished with a soft rubberized coating, the Ergo-sof combines new enhancements such as a clip and retractable cap, with extra comfort.